Cattle were probably the most important animals in India for people. 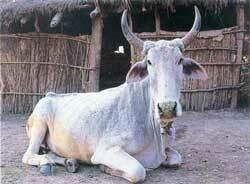 Indian people did not eat cows, because Hindus thought of cows as sacred. But people used cows to pull carts, and for plowing fields, and also used cows’ milk to make yogurt. People in India also got a lot of their milk from water buffaloes. 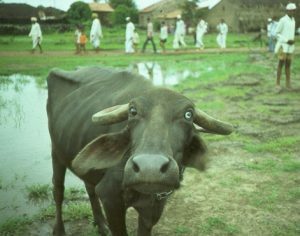 Children (both boys and girls) often went out with the water buffaloes to take them out to their pastures and to water. Chickens reached India from Thailand or China about 2500 BC, and have been common in India since that time. Sheep and goats arrived from West Asia, and donkeys from Africa, probably about the same time. 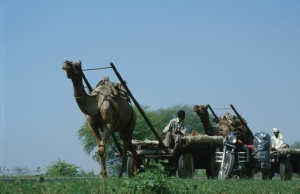 Camels, on the other hand, were not common in India until the Islamic invasions around 1000 AD. 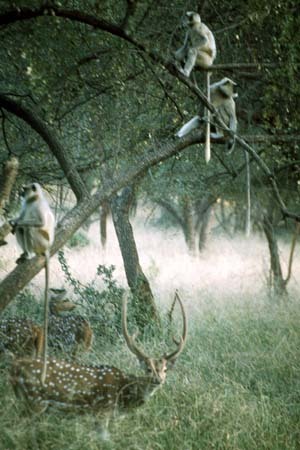 There were also a lot of wild animals in India. Tigers and monkeys and big snakes lived in the forests in some parts of India. 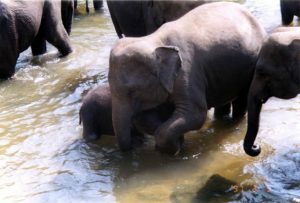 Elephants were born in the wild, but sometimes men caught and tamed them. These elephants pulled trees for building houses, carried heavy loads, and fought in battles. People also used the ivory from elephant tusks to carve statues and make jewelry. Cite this page: Carr, K.E. Animals of ancient and medieval India. Quatr.us Study Guides, July 20, 2017. Web. April 24, 2019.